Colorado is a a state in west central United States in the Rocky Mountains - both Plains and Southwest Native American cultures. The Southwest cultures were adopted by the Apache, Pueblo and Navajo. 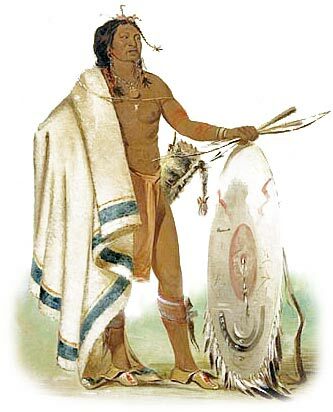 The Plains culture was adopted by the Apache, Arapaho, Cheyenne, Ute, Shoshone tribe, Comanche, Pawnee and Kiowa. The climate, land, history, environment and natural resources that were available to the indigenous Indian tribes in Colorado resulted in the adoption of the Southwest culture and some adopted the Great Plains Indians culture. Meaning of State name: The name is the Spanish word for "red" in reference to the color of the water of the Colorado River. Geography, Environment and Characteristics of the State of Colorado: Eastern dry high plains; hilly to mountainous central plateau; western Rocky Mountains of high ranges alternating with broad valleys and deep narrow canyons. 1864: Sand Creek Massacre - Colonel John Chivington and his Colorado Volunteers massacred Cheyenne and Arapaho men, women, and children. The history of the European invasion brought epidemic diseases such as tuberculosis, cholera, influenza, measles and smallpox. The Native Indians of Colorado had not developed immunities against these diseases resulting in huge losses in population. Exploitation including the leverage of taxes, enforced labor and enslavement were part of their history, taking their toll on the Colorado Indians.